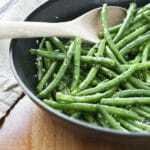 Garlic Green Beans are a family favorite side dish recipe. They're super easy to make with a few simple ingredients like fresh green beans, garlic, butter and fresh parsley and are pretty quick to! Easy enough for weeknight dinner but special enough to serve for holiday dinners as well! Blanch the green beans for around 7-8 minutes and drain well. Run under cold water to stop cooking. In a saute pan, melt the butter over medium-high heat. Add the garlic and saute for 3-4 minutes, stirring frequently until fragrant. Add the beans and the parsley and mix all together. Please note- like all the best family recipes, there are no true amounts, it all goes by taste (and really, I always encourage you to taste your food as you go along!). That being said, the measurements given are based on how I make it when I cook it for my family. Feel free to adjust the amounts as per your preference.